In the small town of Zarephath, PA there exists a door. Everyone knows about it, and everyone knows what it does. Everyone also knows not to open the door: as in NEVER, EVER open the door. But, of course, someone does, and this is the basis for BEHIND THE DOOR. In my mind, this is a novel of cosmic horror. It doesn't feature Cthulhu or any Lovecraftian creatures, (though there are tentacles), but major aspects of it are there. What's behind the door is not of this world. Check. What's behind the door doesn't give a hoot about humans or humanity in general. It is cold, indifferent and unfeeling. Check, check, check. Now, it could also be interpreted as supernatural horror, in general, and that's fine too. But this is MY review and here we are. I thought the other characters were also well drawn and believable. I just wanted to hug both Kari and Cicely as much as I wanted to kick Ed and Toby. (And I wanted to kick a certain place on their bodies that isn't ladylike for me to mention.) Characters that inspire that kind of feeling in me demand to be heard. 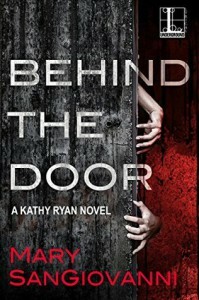 To recap: BEHIND THE DOOR is a fast paced novel that moves right along. Evil in a small town is a favorite trope of mine, and combined with this type of horror, (see spoiler above), this was a must read for me. If any of this sounds vaguely good to you? This is a must read for you too!